I have lived here most of my life – moved here when I was a baby, graduated from Harriman High School in ’82, and now choose to work and play here as an adult (well that’s debatable). I did move away to attend UT in Knoxville and didn’t move home for several years – around 15 actually – but did finally realize how much I missed Watts Bar Lake (WBL). Ok, my husband and I tried having a boat on Fort Loudon – but soon tired of being beat to death due to all the traffic – just not enough room for my taste. Having enjoyed WBL with my family growing up I knew that was what we were missing, so we moved home. I know I had the opportunity to live somewhere else and realize what a beautiful place Roane County is but I still am amazed to hear residents say “there’s just nothing to do here.” Take one look at the event calendar at VisitRoane.com/events and I think you can clearly see there are lots to do – nearly something to do every weekend every month of the year. During the summer there is live music played nearly every weekend, and much of it on the water at area marinas and restaurants. But there was one live music show that was a must-see – Gizmo Jam. A motorized or floating device is required as it was held in the middle of Watts Bar Lake – on Gizmo Island, between Grand Vista Bay subdivision and Thief Neck Island. What a way to kick off the summer on WBL! Held the Saturday of Memorial weekend, those of us lucky enough to have a way to get out there enjoyed a fabulous concert on a perfect sunny day. The bands that made up the Gizmo Jam included Public Apology, The Band Temper, and Drivin’ Blind. Be sure and check out their Facebook Pages to see where they will be playing this weekend. Be sure and ‘like’ the RCVB Facebook page to know what is happening each week. 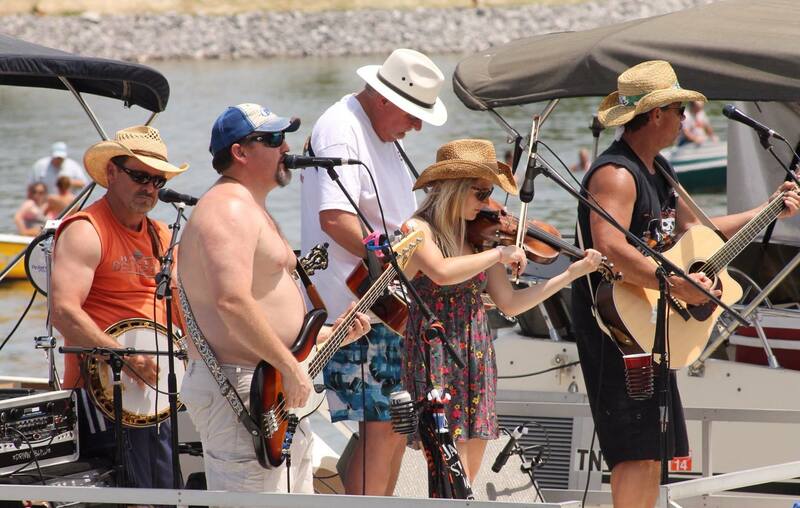 In fact, don’t miss the Half Moon Music Festival on Sunday September 14, another great waterfront concert that can be enjoyed by land or by water. Now in its 14th year, this festival is held in Ten Mile in the Blue Springs Cove (mm 545.3) from 1:30 – 5:30. Forgot to mention – hope the Gizmo Jam becomes an annual tradition!